The pinkosu saree is a drape that originates from Tamil Nadu and is one of the most popular styles of draping a saree in south India. It is considered to be extremely elegant and highly different from the regular draping styles that are prevalent throughout India. The word ‘pinkosu’ refers to the saree having its pleats on the back side of the outfit with the front being completely flattened or having an extremely ironed look. It is known for adding a slight lilt to the hips, which is ideal for women who want to add the illusion of curves on their body. This saree is worn without a petticoat, which is one of the things that make it stand out from all the other sarees in India as they cannot be worn without the help of the petticoat. The petticoat is essentially the under drape in the form of a skirt which is tied at the waist with the help of a drawstring. 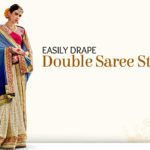 This drape is used in order to provide a support for the saree itself so that it has something to not only rest on but also wrap around easily. While sarees tend to be free sized, petticoats are created on the exact measurements of the woman wearing the drape. Thus, with the significance of the petticoat in mind, the fact that this drape is worn without a petticoat only adds to the allure and mystery of the pinkosu style saree. When pondering how to wear a pinkosu saree, it is important to note that the making of this look is not the fabric or the styles and designs on it but the drape. 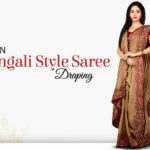 It is through this unusual style of draping that this saree becomes easily identifiable, which has allowed it to create a separate identity for itself when it comes to Indian ethnic fashion. 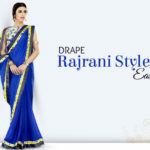 In order to drape this saree, the saree must be wrapped one and a half times around the body in order to create the right effect. The pleats are first created at the back of the waist and then tucked in. Depending on the length of the drape and the measurements of the woman, the number of pleats can vary as it is important to tuck in all the extra cloth on this drape in order to wear it correctly and well. Once the pleats are placed at the back of the waist, the remaining fabric is then wrapped around the body in order to create the skirt like effect of the lower half of the saree. This fabric is mainly wrapped in a counter clockwise fashion in order to achieve the right look and this is then tied at the front by creating a small knot with the sections of the saree being held in place by the pleats at the back and the knots in the front. 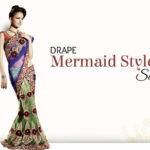 The pallu portion of the drape is then draped over a shoulder in order to get the visuals of a proper Indian saree. Thus, when it comes to a pinkosu saree, draping is what really creates the look of this saree the most. When trying to emulate the aesthetics of Chettinad, pinkosu saree is the right drape to choose. However, emulating styles or trends does not end at wearing the drape correctly and styling it is an extremely important component as well. In order to style the drape in the best possible way, it makes sense to wear the accessories that are considered to be accurate representatives of this area. To start with, south Indian jewelry is one of the most ideal types of jewelry to wear in order to get the authentic Tamil look while wearing this drape. This mostly comprises of intricate and elaborately created gold jewelry which, aesthetically, is usually thicker looking than regular gold jewelry that is not pertaining to this area of the country. These are usually plain gold and extremely expensive, though they create the ethnic look extremely well. They can be found in the form of necklaces, earrings, nose rings, toe rings, finger rings, cummerbunds, and many other styles or types. When it comes to footwear, no matter which type of saree is being worn, high heeled shoes are must because they really contribute to the fall of the saree and make the attire look extremely elegant and graceful and the woman tall and chic. Even with pleats concentrated on the back, this drape looks absolutely fantastic when paired with a great pair of stilettos or even platform shoes, depending on the woman wearing them. Certain kinds of Indian handbags can also look great with this type of saree, for instance, cutdana handbags and moti work handbags as well.